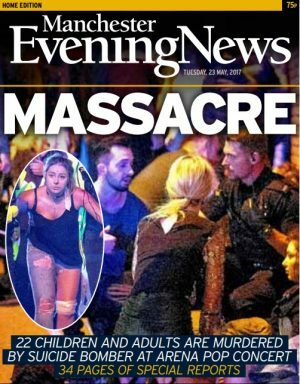 Journalists at the Manchester Evening News worked through the night to bring readers live updates of the tragedy unfolding at the Manchester Arena. Twenty two people are now known to have been killed and 59 injured after a suspected suicide attack following a concert by US pop star Ariana Grande. After the first confused and conflicting reports on social media it soon emerged that a major incident had happened. Reporters and photographers arrived on the scene and at casualty units across the city, with confirmation soon following from Greater Manchester Police that people had died. As nine pages were prepared for the paper's first edition, it was revealed that 19 people had been killed and more than 50 wounded. The online coverage was centred on a live blog with updates from reporters across the city. Later in the night a package of stories was prepared for online publication. A second edition was completed for a 9am deadline, featuring 34 pages of coverage. Editor in chief Rob Irvine wrote a comment piece for the paper and website which read: "There is no justification, no defence for the monstrous crime committed in our great city last night. This was a murder of innocents. And our hearts are breaking. "Last night, in the blink of an eye, lives were taken, families devastated, communities left in despair. "Indifferent to the suffering of their victims, terrorists active in Western Europe have decided to prey on crowds of pleasure-seekers. "And so Greater Manchester has joined a tragic roll-call, sharing our grief with the people of Paris, Nice, Berlin, Brussels, Stockholm and London." It concluded: "What can we, the people of Greater Manchester, do to help those who have suffered so much? "Well, we can do what we do so well. That is we can rally together, just like we did when terrorists wreaked havoc in our city more than 20 years ago. "Last night people offered shelter for those left stranded in the city centre. Others went to give blood. "And even in the small hours of the night, social media was awash with people offering help, thoughts and prayers. "And today, tomorrow, the next day and beyond, we can show the terrorists who want to destroy our way of life that they can never win. "We will carry on, we will make Greater Manchester an even greater place. We will care about each other and support our neighbours. The terrorists will fail. We will prevail."